Hove is a town in the ceremonial county of East Sussex. As of 1997, it was merged with Brighton for local government purposes and in 2000 the borough of Brighton and Hove was granted city status by the Queen. With around 275,000 residents, it is the most populous seaside resort in England. We (me, the ladies and Richey) headed down to Hove on the first weekend of May 2017 to finally visit Hove Promenade parkrun, which has been active since July 2015. Although I like going to Brighton and Hove for its sheer number of vegetarian/vegan restaurants and shops, the town is very busy and parking either difficult, expensive or both. When we arrived, we parked in one of the pay and display spaces on Kingsway which is the seafront road that runs adjacent to Hove Promenade. It's worth noting that these spaces fall within the Brighton and Hove 'inner' parking zone and are pretty expensive. We had planned to have lunch in Brighton after the run and the parking cost £10.40 for the full day (thanks, richey). If you were just staying for the run, you'd probably be alright with 1 hour at £2 or 2 hours at £4.20 - another option would be to park further to the west in the 'outer' zone where the fees are halved. 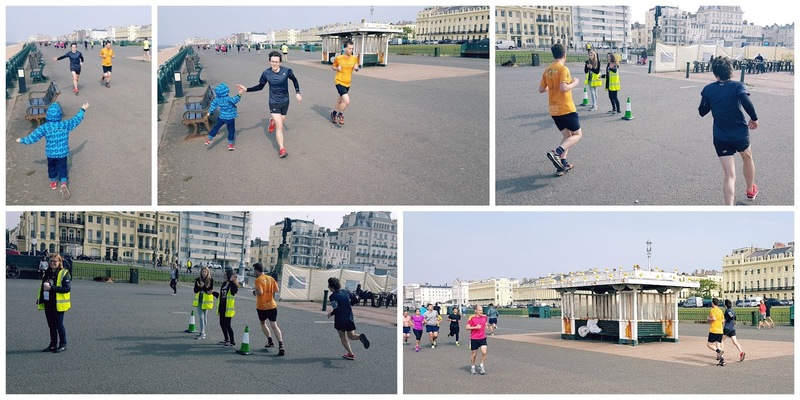 The nearest free spaces I am aware of are over 2 kilometres away on the side streets adjacent the original Brighton and Hove parkrun. Had we travelled down by train, we would have headed for Hove station which is the closest of the options (1 mile away). Alternatively there is Brighton station (1.5 miles away). If you are fairly local, there are a large number of bus option that will get you within a five minute walk of the start. Cyclists can of course use the city's extensive network of cycle lanes to reach the venue. Toilets are available and they are located on the promenade about 100 metres west of the start-finish area. 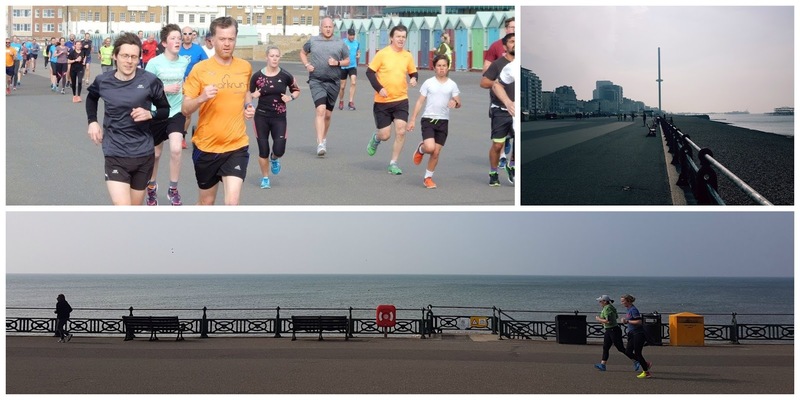 The run itself starts on the promenade right next to The Lawns Cafe and this is also used as the post-run tea/coffee social venue - it only has outdoor seating so I imagine the numbers of people at the post-run gathering are largely dictated by the weather conditions. 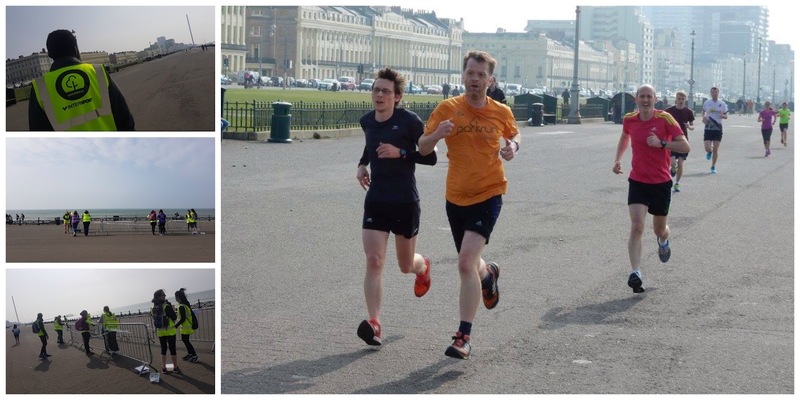 This parkrun features an out-and back style course, but the start-finish is right in the middle of the course rather than being at one end. Some people may refer to the course as 2 laps and that does make some sense. It is a flat course and the promenade is very wide. 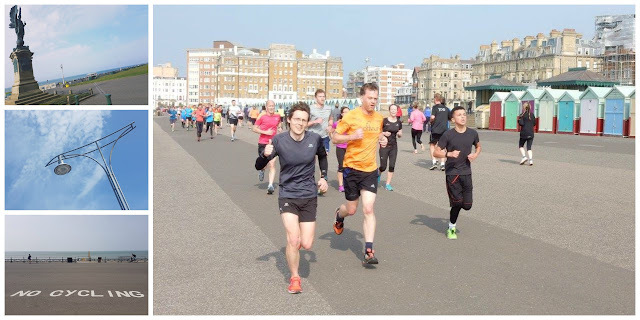 The runners are asked to keep to the southern half of the prom (the half closest to the sea) and the turnaround points are run anti-clockwise (left hand turns). From the start, the participants simply head west past the colourful beach huts and after a 180 turn at the turnaround point, they head back to the east. In the distance it's now possible to see the ruined remains of the West Pier which was originally opened in 1866. It was the first pier to be given grade I status, but due to repeated fire and storm damage it has now been declared as 'beyond repair' by English Heritage. Participants will also spot the 162-metre-tall i360 observation tower - it is the world's first vertical cable car and the world's 'tallest moving observation tower'. As the name suggests, passengers (up to 200 at a time) on board have a 360 degree view of the surrounding areas including the Isle of Wight, Beachy Head and the south downs. Where was I? Oh yeah. The runners continue past the start area and continue until reaching the eastern turnaround point, which is just a few metres away from the Angel of Peace statue which marks the Hove/Brighton boundary line. Both of the turnaround points are marked with cones and are accompanied by wonderful marshals. The halfway point is found back at the start-finish area, and all that is left to to is repeat the double out-and-back or, if you prefer, the second lap. It's then time to dive into the finish funnel, collect a token and have it scanned along with your personal barcode. While out on the course, it's worth checking out Hove Lawns (aka Brunswick Lawns) which separate the Prom from the main road - they sit on an area of land which is protected by an Act passed in 1830 which states that no building may be erected south of Brunswick Terrace (which is just just across the road). The lawns have seen many interesting events such as the landing of a biplane in 1911 - you can find lots more information on the very interesting 'Hove in the Past' blog. With this being a seafront course, it does suffer from the effects of the wind. When we ran here, we had a head wind blowing from the east, which was hard-going running into, but we did take advantage of the tail wind when heading the opposite way! One of the natural processes that takes place along the sealine is longshore drift, which means that pebbles and shingle can end up covering the promenade as they are moved around by the wind and sea. In extreme cases this could lead to the event being cancelled, so keep an eye on the event's news and social media pages if you are planning a visit. The surface is fairly smooth tarmac (suitable for buggies and wheelchairs) and is nice and wide. Cycling is not allowed on the promenade as there are bespoke bike lanes adjacent to the main road, so there shouldn't be any issues with passing cyclists. However, I did see plenty of cyclists ignoring this while I was there, so keep an eye out just in case. We visited the venue on 6 May 2017 at event #92. There were 286 participants and the results were processed a short while later. I recorded the course GPS data and you can view it in detail, right here - Strava: Hove Promenade parkrun. A big thanks to the day's official photographer and to Dani for the running photos. 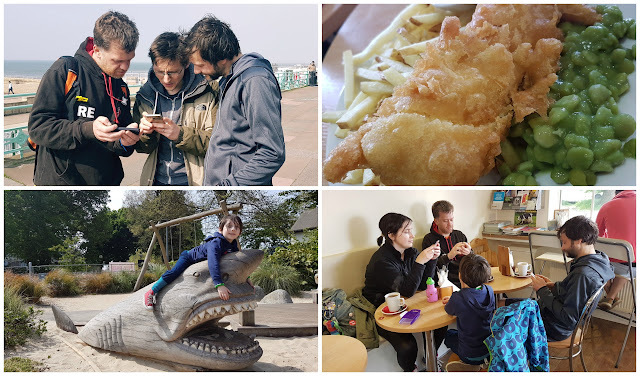 We had made our own post-run lunch plans so we headed off into Brighton to a vegan cafe called The Loving Hut which is located in a park called The Level. It was quite a walk from the parkrun venue, but so very worth it. I tried vegan fish and chips for the first time and was blown away by how amazing it was! We'd had another great day out in Brighton and Hove, and I have now run at all four of the city's parkrun venues.